The 33rd issue of the newsletter from Poetry Archive of New Zealand Aotearoa is available now for download as a pdf. Inside Spring 2018, Volume 9, issue 1: Doreen Price (1900-1947) by Rowan Gibbs; In memoriam: Jill Chan, 1973-2018; National Poetry Day poem: My Homage to Pinetree by Tula Regos; report: Winter Readings 2018; poetry by C.A.J. Williams; new publications by PANZA members; donate to PANZA through PayPal; recently received donations; about the Poetry Archive. The Poetry Archive of New Zealand catalogue has now been updated to reflect new acquisitions July-October 2018. This year’s National Poetry Day is being held on Friday, 24 August 2018. PANZA has chosen a rare rugby poem, ‘My Homage to Pinetree’ by Tula Regos, in celebration of the late Sir Colin Meads, who passed away last year. The poem is among the poetry donations recorded at the New Zealand Rugby Museum which I have recently written about in the latest issue of Poetry Notes, Winter 2018. Thanks to Stephen Berg, the Director, for help in locating the poems. 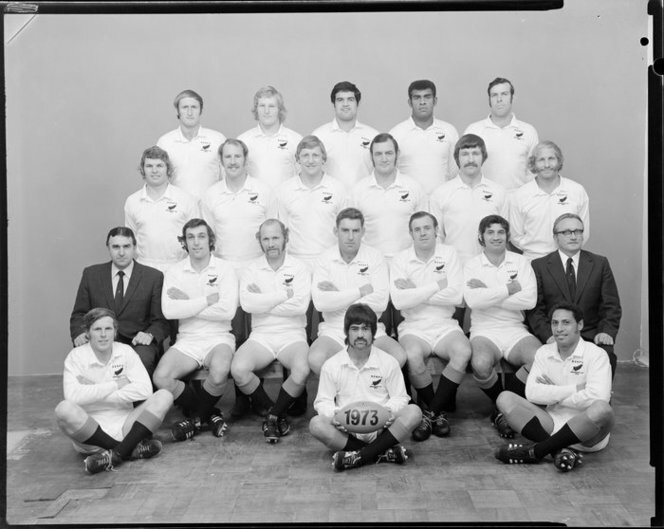 The poem about Pinetree records the unofficial retirement of Meads, when he turned out for a President’s side in 1973 and defeated the All Blacks. Yet another fitting addendum to the Meads legend. The previous year he withdrew from the 1972 All Black trials, which signalled the end of his career. The poet is Tula Regos, a Manawatu local, obviously writing under a pseudonym, and we are currently unable to find out who he was, as the name of the poet isn’t recorded with the poem donations by the New Zealand Rugby Museum. There are a sizable number of his poems held by the Museum (at least 36 donations recorded, and some are multiple poems covering individual test series), and Regos seems to have written mostly on and recorded All Blacks matches, 1972-84. There are poems on the Manawatu team as well. A Papers Past search revealed that “Regos” is Turkish for “troubadour”. On the President’s game itself, Alex Veysey’s indispensable biography of Meads from 1974 contains a photo of the President’s team. 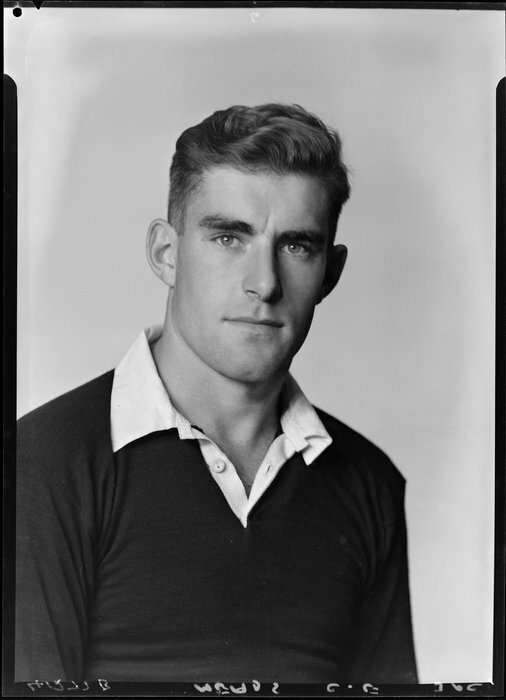 It includes former All Blacks Sid Going (Vice-Captain), Brian Lochore and Graham Thorne, a star in the backline. No doubt a more than handy and capable side to take on the current All Blacks that year. Here is Tula Regos’s poem on the famous game and moment in New Zealand Rugby. A pleasure to be seen. And scored six mighty tries. It really made their day. On radio and Tee Vee. Could not fell that gang of Meads’. He’d always helped to win. This week at Eden Park. Are made of better stuff. To replace our OLD PINETREE. The 32nd issue of the newsletter from Poetry Archive of New Zealand Aotearoa is available now for download as a pdf. Inside Winter 2018, Volume 8, issue 4: Rugby poetry at the NZ Rugby Museum by Mark Pirie; classic New Zealand poetry by Honor Gordon Holmes (1911-1953); Paul McCartney 2017 Auckland concert poem by Michael O’Leary; comment on the poetry of Dan Davin by Niel Wright; poetry by Mark Young (Australia/NZ); donate to PANZA through PayPal; recently received donations; about the Poetry Archive. The Poetry Archive of New Zealand catalogue has now been updated to reflect new acquisitions September-November 2017. The 30th issue of the newsletter from Poetry Archive of New Zealand Aotearoa is available now for download as a pdf. Inside Winter 2017, Volume 8, issue 2: Christina Fulton (1838-1874) by Rowan Gibbs; National Poetry Day poem by T E L Roberts; poetic tributes to Princess Diana 20 years on; event report: Winter Readings 2017; poetry by Mary Maringikura Campbell; Selina Tusitala Marsh appointed NZ Poet Laureate; donate to PANZA through PayPal; recently received donations; about the Poetry Archive. The Poetry Archive of New Zealand catalogue has now been updated to reflect new acquisitions June-August 2017. PANZA celebrates this year’s Phantom Billstickers National Poetry Day, 25 August 2017, with a classic New Zealand poem by T E L (Thomas Edward Lloyd) Roberts b. Sefton 1873; d. 1952. Roberts was one of leading poets of the Star group of Christchurch newspaper poets selected and arranged by PANZA Archivist Mark Pirie as a special issue of broadsheet, No. 12, November 2013. T E L Roberts contributed poems to the Ellesmere Guardian in Canterbury prior to the Star and published the collection Rimu and Rata (1920) and two collections of memoirs about his time in Seddon and Motunau. He was a farmer and a well-known rural figure: Waipara County Council 1914-17; Executive Member of the Farmers’ Union; President of the Waikari Valley Sheepowners’ Assn. ; and Secretary of the Meat Producers’ Union; he visited Britain and France in 1905. Roberts wrote the memoir Motunau, or The Hills of Home, in 1946, same title as his poem below. His prose was reprinted in 1998 and is now considered a definitive history of Hurunui. The evocative poem by Roberts certainly captures, in the tradition of landscape painters and Romantic poets, the beauty and locality of the place he lived in and roamed. Like many early poets of the 1920s period, we are perhaps yet to fully come to terms with their contribution to New Zealand poetry. A fire among the snow. Among the hills of home. A requiem for the day. A story that is told. When love is at the spring. That stretch we dared to skim. Among these hills of home. And all the man is lost.